Charlie and Linnaea Wright, a husband and wife team of U.S. Fish and Wildlife Service bird-observers, peer from the windows of Healy’s bridge whenever the ship is underway in daylight. Their work this summer is particularly important because of a major seabird die-off over the last three months in the Pacific Arctic region. The emaciated bodies of birds point to starvation, but the cause of the die-off remains unknown. Healy's timely mission through the northern Bering and southern Chukchi seas could help inform the underlying cause. With each sighting of even the most indiscernible speck in the sky, they log the bird’s identification. This year, researchers have special permission to collect bird carcasses at sea that will be sent to a U.S. Geological Survey National Wildlife Health Center to evaluate cause of death. 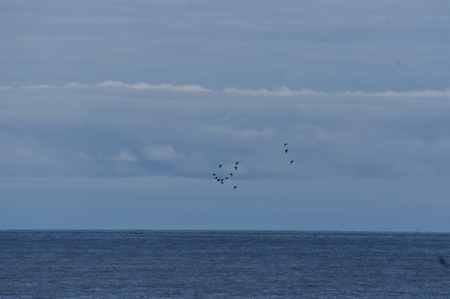 "Our route is taking us through some productive areas with large numbers of birds this year," notes Charlie, who sailed on Healy last summer. Dr. Kathy Kuletz is a leading seabird biologist with the USFWS who is coordinating a massive effort to collect bird carcasses. She points out that seabird die-offs are especially concerning to northern and western Alaska residents who depend on subsistence harvests. One bird species that has been dying this year is the murre, which nest in large colonies on cliff faces. Adult murres and murre eggs are a source of food for local residents. In a recent Alaska Public Radio interview Kuletz said, “People who live in these remote communities rely on birds for eggs or meat. They noticed the birds weren’t coming to the colony, or they were finding sick birds and birds acting odd.” Because seabirds are strongly linked to the ocean for food and habitat, sick seabirds may indicate changes in the ocean food web.